I am not usually a fan of love at first sight romances, but what Cathy Maxwell managed to do with The Groom Says Yes is worthy of applause. She manages to convince me that a couple can meet, fall in love and find their happy end in a course of just a few days. The Groom Says Yes is the third installment in The Brides of Wishmore series, but it can be read as a standalone. Some characters are recruited from the two previous stories, while some are newly introduced. 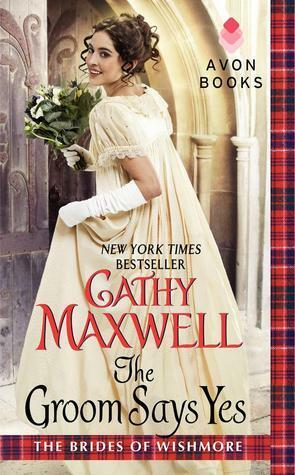 Cathy Maxwell writes beautiful and rich stories and this one is no different. The story started strong, adventurous, suspenseful, with a prison escape and lots of action. But unfortunately after a while it started to drag. The major problem was that both hero and heroine had these long monologues; especially the heroine who had ones concerning her moral doubts. These monologues slowed the pace of the plot. Fortunately, after a while the author shifted her attention from the heroine’s doubts to building the relationship between the hero and heroine. Once they were brought together, things started to roll again. From that point on until the very end the story was truly a delightful read. I like both the hero and heroine. I like how they change and grow through the story. While the heroine realizes that she has to live her life to the fullest and not hide behind her pianoforte and charitable work, the hero realizes that being angry is the wrong path in life. But what I like the most is their realization that love is a strong and powerful force and once you find your soul mate you should never let that person go. As I already mentioned, the Cathy Maxwell is a great storyteller and this was a highly satisfying read for me.